Old Brampton Church has a very active group of bell ringers who enjoy ringing together. Over half of our ringers are still at school, and ringers of mixed ages and abilities ring together, so our ringing sessions are usually very lively. We don’t just ring at Old Brampton! We ring at other places on practice nights and at ringing meetings, events and outings, and socialise with other ringers. We also enter local ringing competitions and have recently won the Newman Cup and Arthur Ashby Cup. We are members of the Derby Diocesan Association of Church Bell Ringers, and you can follow us on the Bell Ringing Derbyshire Facebook page. Old Brampton is a founding tower of the East Derbyshire and West Nottinghamshire Association of Church Bellringers. Our young ringers meet with other young ringers at Derbyshire Young Ringers events, where they have fun socialising and ringing together. 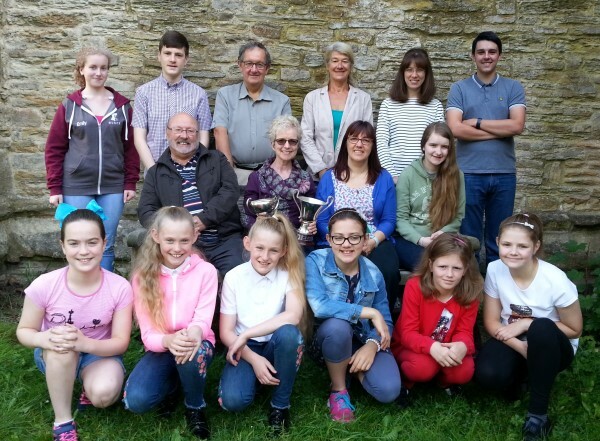 The Derbyshire Young Ringers team compete in the annual National Youth Contest, and have come second on two occasions. Church bells are the loudest unamplified and heaviest musical instruments in the world – the ultimate heavy metal! They are rung in the traditionally English style of full-circle ringing with a rope round a wheel. They make a glorious sound which has the power to stir emotions and open people's souls. There are 6 church bells at Old Brampton. The largest weighs 12cwt or 0.6 ton, and their history dates back to the 16th century. Here's a record of the history and details of the bells. Current details of the bells are on the Dove website. Bell ringing is a fantastic year-round social, inexpensive, year-round, active hobby for teenagers, older children, adults, individuals, couples, families and groups. Watch this video about taking up ringing as a hobby. All visitors and new recruits are very welcome. If you are a visiting ringer, or just want to see what ringing is like, please contact the Tower Captain (Sue Hall via contact us) or visit us in the tower on a Monday evening at 7:30pm. You don't need to be strong, musical, mathematical to ring and we welcome people of all faiths and none. You do need to accept that it takes time to learn, although you will have plenty of fun doing it. It is a great year-round social activity for all ages (9 upwards), and keeps you fit and toned too! Watch this video about learning to ring. We don’t charge for ringing lessons, but we do expect you to come to practices and, when you can ring in time with others, to ring for Sunday services. You then qualify for joining the Derby Diocesan Association of Church Bell Ringers. When you can ring accurately, you can ring for weddings when you receive a fee for your ringing! Bells make a glorious and joyful sound to welcome wedding guests and celebrate your marriage. They can be rung before and after your wedding service by skilled, experienced ringers. Please see the Wedding Music & Bells leaflet and the Wedding information on this website. Old Brampton Bell Ringing Flyer Lots of information in a nutshell. Discover Bell Ringing website Entertaining and informative with videos on bells, ringing and learning to ring. Your Perfect Hobby? Discover the benefits of ringing. Or just visit us! – Please contact us before you visit to check that we are ringing.